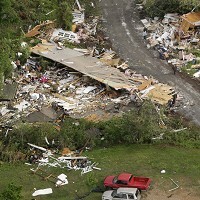 Eleven people have been known to have died after a series of storms hit northern Arkansas in the US. The latest victim, who was in a home near Highway 230, died when the storm on the second consecutive night moved through Sharp County, the Arkansas Department of Emergency Management has confirmed. Earlier on Monday, 10 people were killed when western and central Arkansas faced a severe tornado and flooding rains. A high risk warning has been issued by the National Weather Service and covers the region from the north east of Memphis, Tennessee, to just north east of Dallas and includes a large swath of Arkansas. Travellers planning a trip to the US might want to make sure they have adequate travel insurance to cover for any inconvenience due to flight disruptions. At least 100 homes in the East Texas town of Edom were damaged on Tuesday night, and a woman was injured when her mobile home was destroyed, officials said. There were also minor injuries reported in Louisiana when an oil drilling plant turned over in high winds. In south western Michigan, nine people were sent to the hospital, one with serious injuries, when lightning struck a park where children and adults were playing soccer, police said. Dozens of tornado warnings had been issued in Arkansas on Tuesday night. Strong winds peeled part of the roof off of a medical building next to a hospital in West Memphis, near the Tennessee border, but no one was inside. The latest round of storms began as communities in much of the region struggled with flooding and damage from earlier twisters. In Arkansas, a tornado smashed into Vilonia, just north of Little Rock, on Monday night, ripping the roof off the grocery store, flattening homes and tossing vehicles into the air.